DEER have horns, right? But a long time ago, the deer did not have horns. Instead, dogs had horns. How did the deer get the horns? Here is the story. It was a very hot day. A couple of deer went to a river to drink. They were husband and wife. After arriving at the lake, they immediately drank some water. Suddenly, the wife saw an animal coming. “My husband, who is he? Wow! He is very handsome with his horns,” said the female deer. “Oh, that’s my friend. He is a dog. By the way, did you say he was more handsome than me?” asked the male deer. He was jealous. 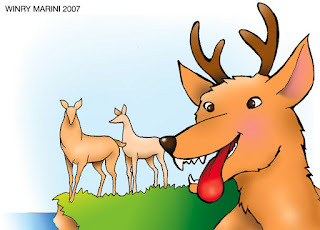 “Hi, how are you?” asked the stag to the dog. “Not really good. You see my wife over there? He thinks that I cannot run fast like other male deer. Do you mind if we have a running match? I really want to practice,” said the stag. “Don’t worry, my friend. Let’s have the running match now.” After that, the running match began. The stag won. Then, he tried to cheer the dog up. “Well, don’t be sad. You cannot run fast because you have your horns on your head. What if you let me wear the horns,” asked the stag. “Don’t worry. I will be very careful,” replied the stag. And then he immediately put the horns on his head. “Wow! My wife is right. I really look great with these horns,” said the stag to himself. Then, they started the running match again. The male deer ran as fast as he could. He ran very fast and did not stop. He was trying to steal the dog’s horns. Belum ada komentar untuk "The stupid Dog"